Welcome to Florida’s Birding & Photo Fest— celebrating the love we all share for birds, nature, photography and the great outdoors. WE’VE MOVED OUR FESTIVAL HEADQUARTERS! 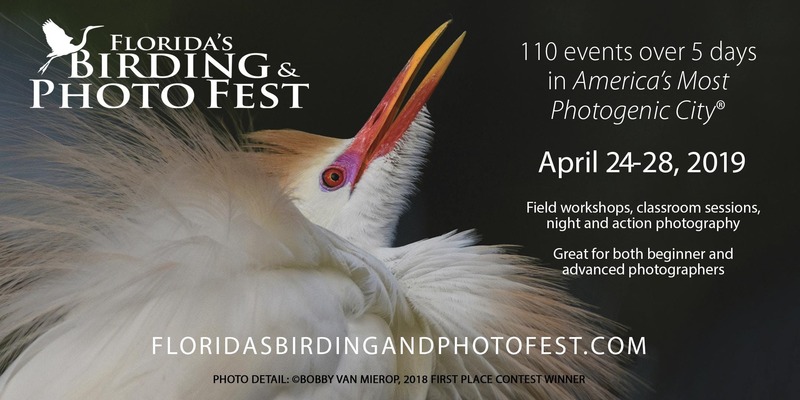 Located just 6 miles south of the St. Augustine Alligator Farm, the Celebration Hall at St. Anastasia, located at 5205 A1A South is the new home to Florida’s Birding & Photo Fest. The 2019 Birding & Photo Fest will feature the return of festival favorites, world-class photographers along with new professionals and instructors who will offer technical training opportunities and more birding in-field programs than ever before. As always, festival participants will benefit from insights and instruction from a collection of upper echelon international nature and wildlife photographers — a group that continues to solidify Florida’s Birding & Photo Fest as one of the premier events in North America. And of course, the community of St. Augustine, Ponte Vedra and all of Florida’s Historic Coast is welcoming bird lovers and photography aficionados with the friendly hospitality you’ve come to expect. With more than 110 exciting birding and outdoor photography events, field workshops, classroom sessions, night and action photography… the festival is a great learning opportunity for both beginner and advanced photographers. If after creating your schedule you should decide that you would like to attend another workshop, simply come back to our website and order more. We’re happy to assist if you have questions. Contact us at FloridasBirdingFotoFest@gmail.com.